The two conservative parties – particularly, Fine Gael – are increasing their grip on Irish politics. Three polls in January – Red C, Ipsos MRBI and Behaviour & Attitudes – show a resurgent Fine Gael led by an increasingly popular Taoiseach. While Fianna Fail is struggling to build on its 2016 result, Fine Gael is racing ahead. Combined, the two conservative parties are approaching 60 percent and this doesn’t count the Independent Alliance and the conservative (gene-pool) independents. In Dr. Adrian Kavanagh’s vote-to-seats model, Fine Gael’s performance is even stronger. 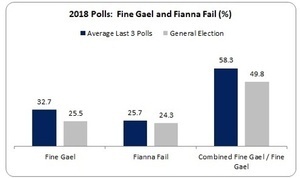 While this is only a model, Dr. Kavanagh projects that the three polls could result in Fine Gael winning up to 70 seats, or 44 percent of Dail seats. At this level, Fine Gael is knocking on the door of single-party government, even if they have to rely on outside independent votes. Again, in Dr. Kavanagh’s model, the two parties combined could dominate the next Dail, with a combined 117 seats, or 74 percent. For progressives, the story is one of stagnation at best. 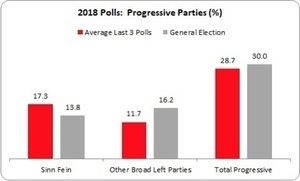 While Sinn Féin sees an increase (with a possible future boost by its new leader, Mary Lou McDonald), this is cancelled out by the decline of other progressive parties, leaving the combined vote slightly below the 2016 election result which, for progressives, was itself a disappointment. Unfortunately, Dr. Kavanagh doesn’t have the full seat projections for all these parties. Sinn Fein sees, on average, an increase of three seats while the other parties will be lucky to hold on to what they have. So why is Irish conservatism doing so well, while progressives are treading water? One reason is that Fine Gael has been able to sell a twin-message of ‘change’ and ‘stability’ with a bit of ‘radical centre’ thrown into the mix. Is this just vacuous branding? Over the last three years there are 155,000 more people at work – an increase of 10 percent. Unemployment has fallen from nearly 12 percent to just over 6 percent – a decline of over 100,000 people on the dole. Someone on the average wage will have received an increase in take-home pay of over €1,700 annually in pay increases and tax cuts (on average). Deprivation rates are falling, severe arrears are falling, public sector pay is being restored: after the roller-coaster of crash, recession and austerity things are settling down for many people. This can be seen from Eurobarometer’s poll surveying people’s trust in their national government. Prior to the crash, a substantial proportion of the population ‘tended to trust’ the Government – 41 percent. Shortly after the crash this figure dropped to 20 percent. Now, however, trust is returning to pre-crash levels. It is reasonable to assume this is related to people’s perception of the economy and their own financial and social circumstances. But another reason screams out: there is no alternative. Progressives don’t currently constitute an alternative capable of governing or significantly influencing the debate. It would be interesting to poll public perceptions of the Left’s economic policy. I suspect that, beyond taxing the rich, redistributing income and spending more on public services, people would struggle. Not surprisingly – the broad Left lacks a common economic narrative even as it makes sensible demands. And for many progressives, this is compounded by a vocabulary rooted in anti-austerity protest that is increasingly disconnected to growing numbers in this period of recovery. This is all the more frustrating given the evidence of people’s re-emerging progressive instincts, whether that is evidenced by support for public services and capital investment rather than tax cuts, concerns over both economic and political inequality, frustrations over the conduct of banks (tracker-mortgages) and low-road employers. Just as the winds are starting to blow in our favour we have no sail to put up. How do we start addressing this? We, first, need to construct an ‘economics of recovery’ rooted in the world of work that can directly connect to people’s workplace experience. People want a voice in the workplace –about wages and working conditions; people want social security – when they become ill, or are starting a family, retire, in need of housing or healthcare, or are between jobs; and people want income certainty and an end to precarious working hours and intermittent pay. 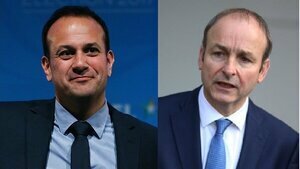 These are three strong starting points for an ascendant progressive politics, connecting to the Taoiseach’s ‘early risers’ or, in more old fashioned language, the working class. Secondly, we need to develop a politics of common sense, a way of formulating and presenting issues that capture the debate. This common sense can emerge out of a sense of decency (shouldn’t wages at least guarantee that people don’t live in poverty – hence, a Living Wage); out of what’s fair (people’s health care shouldn’t be dependent on income – hence, free healthcare); or out of logic (doesn’t it make sense to rent or sell homes at cost – hence, cost-rental and cost-purchase). Of course, we have to show how common-sense policies can be delivered. Not only are there economic constraints, and institutional and cultural inertia; there are powerful interests who can portray such policies as utopian or simplistic, in order to maintain their economic status. Third, we need a practice of cooperation to make all this work. This requires maximum progressive cooperation; not only between broad left parties, but with civil society organisations and the trade union movement (what Conor McCabe has described as a ‘commonwealth of civil society and trade unions working in tandem with a progressive political sphere’). If the broad Left is to provide leadership in the debate, it must start in its own backyard. And, quite simply, leaders bring people together, unite, and give everyone a stake in the endeavour. Apart from the Coalition to Repeal the 8th Amendment – the lead example of cooperative work – there is the National Homeless and Housing Coalition; a body composed of all the broad Left parties, a number of trade unions and – most critically – civil society groups who work in the areas of housing need. They have developed a common sense programme to address the housing crisis and are planning a major demonstration on April 7th in Dublin. This is a crucial development – not just because it aims to keep the housing crisis high up the agenda – but because, through it, progressives can establish themselves as the principle alternative to current Government policies. In effect, Fianna Fail has opted out of the housing debate since it still clings to the old, and discredited, policies of developer-led tax breaks. This process of cooperation and a common programme, becoming the principle alternative to the Government – this is why the march on April 7th is so important. If it is a success then this kind of cooperation of the commonwealth can start to become a habit – the first step to becoming a major political and social force. There are no short-cuts; there is no recipe to take down from the shelf. An economics of recovery, a common-sense politics, the practice of cooperation – this doesn’t guarantee success. But one thing is clear – if we continue the way we are, we shouldn’t expect history to bail us out. Change is certain, yes; but progress is not. Posted in Misc and tagged Michael Taft, taft on tuesday at 10:23 am on February 13, 2018 by Michael Taft. So a common sense left wing policy is to enable right-wing governments constantly. What’s a common sense right wing policy? To destroy their junior left wing partner? There’s a pattern to your wisdom here, b. Well what makes Labour stand apart? Destroying itself to enable Fine Gael. Mad sensible. very easy to win an argument when you answer your own question isn’t it? I wasn’t arguing with you, I was stating the fact that collaboration with the right is not a sensible left wing strategy. @ahjayzis. you say “collaboration with the right is not a sensible left wing strategy” and that is correct if there is a majority of people looking for left-wing politicians. But once you have mix of left-ist, centre-ist and right-ist people – then you need to compromise. 1. I don’t think *any* or our main parties are particularly far from centre. 2. if you have a collation government you need compromise – and if you have a collation government between a left-leaning and right-leaning parties, then your compromise will be somewhere in the middle. That’d all sound very sensible and centrist if FF and FG, two identical, ideologically in lockstep parties, had not shied away from a formal coalition this time around. You do not build electoral support for your principles if you jettison them every ten years and destroy your credibility a la Labour. It’s literally Sisyphean. So true – for me there is no viable alternative to either FF or FG. I’d love to see a strong left party (re)appearing that could challenge them. I think it’ll take Sinn Fein going into government with Fianna Fail or the like. They’re clogging up ‘lefty sounding’ space and will do until they’re exposed as the poor man’s FF. Good article, agree with most points, but SF is not a progressive party. Shame that you described FF in the first part of your first sentence. Thanks for that, Cian. It is supposed to read 2017. 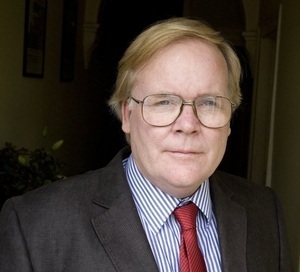 The perennial problem for the ‘left’ is that the Conservative/Anti-Radical parties are backed by those holding all the cards – any debate requiring radical ideas are dismissed immediately by the insulated class and their very mailable media partners as the rantings of the mentally unstable, civilised change will never come from the quagmire of political parties in Ireland, it’ll come from a sheer fault of enough peed-off people versus the anti-social criminality demonstrably evident in certain circles, the media in Ireland do an excellent job of quelling any radical thought as they are all, with a few exceptions, thoroughly compromised. SHOCK! First Time In History Recession Doesn’t Last Forever! You are correct – people aren’t stupid, and the left are too busy jostling amongst themselves, the right are focused on profit, retaining wealth and preventing any policy that may threaten that wealth, it’s way easier to focus various groups on that agenda, the media is a useful cog in that nexus, which helps manufacture a narrative of what they regard as reasonable and what is dismissed as headbanger anarcho-communism. Questions have to be asked as to what type of society we want – a US style cut-throat society with huge and dangerous disparities, (we ain’t far off with mouldy ambulances and prefab schools) or a more northern European view of society with built-in stability, and where good education is regarded as the life blood of the country and will eventually pay for itself (see Finland) – we are going backwards. I’m interested in what you mean by ‘built-in stability’? Things like it being harder to fall into homelessness because the state puts breaks on the financialisation of homes, or to go bankrupt from healthcare needs – a floor below which you cannot fall. 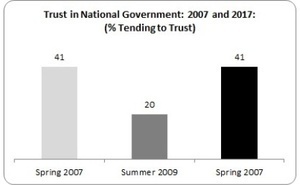 So either we don’t distinguish between government and parliament, or our trust in ALL parties dropped in 2009. It’s a fairly weak and toothless rubber stamp of a parliament though. There’s no actual holding to account of the government. Especially now even the main opposition party is supporting the government. Ah yes, the squabbling Irish ‘left’, jumping on everything sensible with their canned/academia-insular responses about radical (read juvenile, or empirically-failing) ‘solutions’ to everything. A waste of everybody’s time, especially their own. Why are FF and FG called conservative and the left (including SF ffs) called progressive? What progressive ideas have the left come up with only more tax? FF and FG are conservative by nature, you can tell this because the country they’ve given us, after the 2008 crisis, is as close to the country as it was in 2006 as possible, the same wealth inequalities, the same people in charge, the same problems and the same sort of crash coming down the tubes at us again. They started with the premise that all must return to how it was in the lead-up. Which is inherently conservative and pretty daft and sinister.